This small medieval walled town, listed as one of ‘les plus beaux villages de France’, has it all, from its architectural significance, breathtaking views, magnificent walks, three caves (Grottes des Canalettes), historical Fort Liberia, lively Easter parade with Giants, arts and crafts, boutiques, restaurants and bars, Little Yellow Train, and even horrible histories and witchy warnings. Best of all it is easily accessible by car, train and bus! 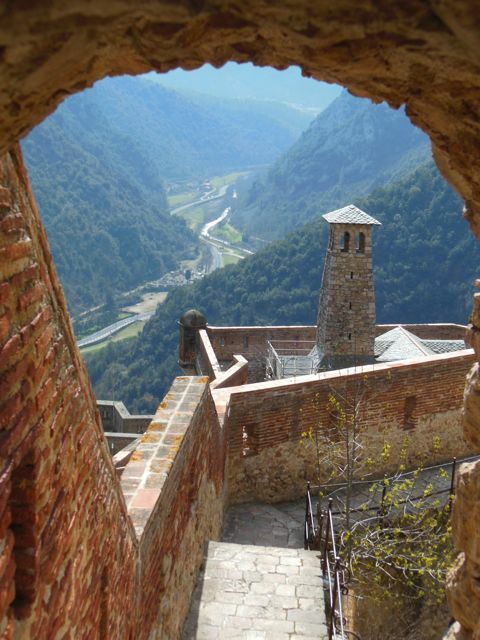 When Villefranche-de-Conflent was built in 1095 by Guillaume-Raymond, count of Cerdanya and Conflent, it was known as Villa Franca (town of free-trade) and allowed special tax privileges to attract skilled and assorted trades people. Settlers could live tax-free for three years, after which they could pay as little or as much as they wanted, whenever they chose. Situated at the confluence of the rivers Têt, Cady and Rotja, it was fortified to protect the surrounding valleys from invasion. It is now one of the fourteen Vauban sites on the UNESCO world listing, due to the royal military architect’s remodeling of the town in 1681, when he added height to the Ramparts and built the Fort Liberia above. 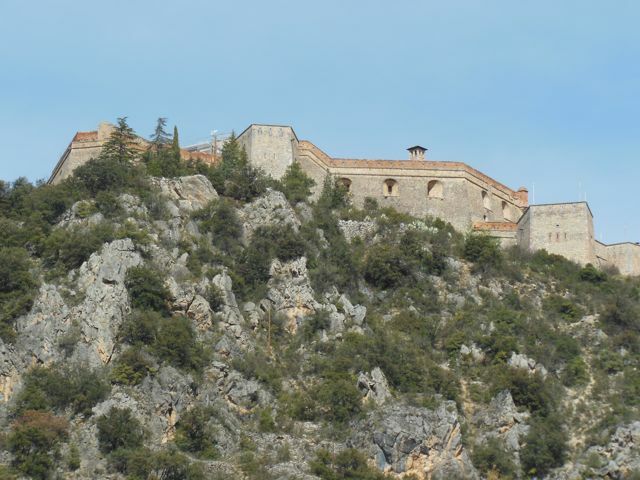 Once in the walled town, if you wish to visit the Fort, pop into the Café Canigou on the Place du Génie, and ask to be taken by ‘Shuttlebus’. Alternatively, you can walk via the 734 underground steps up through the mountain, (although there has to be an attendant by the door for you to enter), or by the open footpath. The way is signposted. Warning! Steps or path, it is rather a steep walk, so some may prefer to spend the extra euros for the shuttle (Land Rover). We walked up the path, and the views of the valleys and mountains on the way to the fort are beautiful. Once inside, you can buy tickets or a guide, available in English, at the bar leading off from the courtyard of the fort. Especially worthy of seeing is La Prison de Dames with its horrible history of the female criminals, most famously Anne Guesdon and The Chaplain, living out the remaining 36 years and 43 years of their lives, respectively, chained to the wall of their cell. Whilst I couldn’t help but feel the horror of being imprisoned in this way, there is no doubt that they did commit crimes most horrid. Poisonings and child sacrifices would normally have lead to them being burnt at the stake, but they escape this punishment due to the Kings concern over international relations! We decided to brave the alternative route down to the town, “les milles marches”, built under Napoleon the Third in the Nineteenth Century. As we descended, the way seemed endless in the narrow, dimly lit tunnel. Chills ran down my spine as my thoughts turned to the 22 men who fell to their deaths whilst creating this amazing construction. 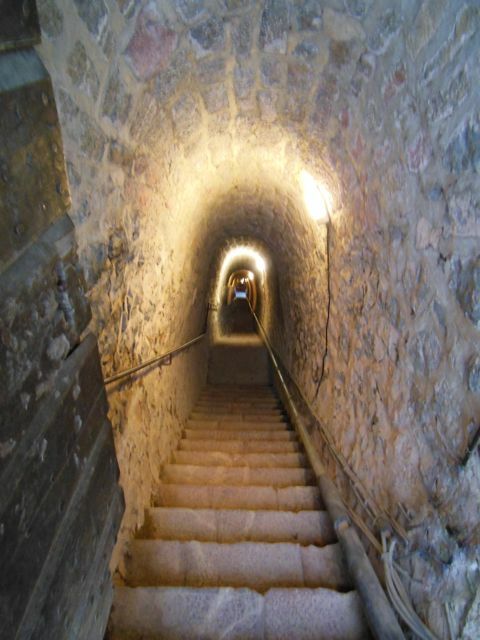 Including all the steps of the passageway and those of the fort there are 1279 to climb and descend! The Ramparts, or City Walls, are worth paying to walk around. They really are in fantastic condition, and you can see the architectural influences from the Middle Ages up to the 17th Century. You can choose to walk round alone, or with the aid of an audio guide. I believe there is also the option of a guided tour, as with the Fort. Even in winter, this town is still charming, and you can walk the Ramparts and venture up to the Fort. A couple of café’s and boutiques will be open for business, but expect most to be closed. However, from March onwards the town really starts to wake up, and by summer it is positively buzzing. The 11th Century Church is worth a visit, and you will notice the rose marble, which is local to the area. There is also a small Museum to see. Each shop is so individual, with handmade crafts including jewelry, soaps and earthenware. You will also notice a few shops selling handcrafted witch dolls, or Poupées Sorcières. Do not be afraid, these are believed to bring luck and protection when you hang them in your house or nursery! The many restaurants and cafés are yours to discover, and look delightful. Sit in the squares either end of the village, taking in whatever magical atmosphere is on offer that day. If you’re around at Easter, look out for the yearly Fête des Geants which takes place over Easter weekend. This tradition is actually carried out across Europe, although it is most deeply rooted in Catalan areas, and stems from medieval times. Traditional music, enormous Papier-Maché costumed giants representing an historical aspect of their town, a fun family day out and a chance to bring out your inner child! There really is so much to do and see in this area. We took the Yellow Train (Petit Train Jaune) back in October, when it was so quiet we had a whole carriage to ourselves! I highly recommend this as a day out. Be aware it will be busy during the summer months, and the outdoor carriages will potentially be extremely hot. We have yet to discover the wonders of the caves, Grottes des Canalettes, however, I think it would be a shame not to see them. The pre-historic cave, la Cova Bastera is located just opposite the walled Villefranche de Conflent, and the other two caves, Les Canalettes and Les Grandes Canalettes are within 500m of the town as the crow flies. In July and August there is a music show in the cathedral of Les Grandes Canalettes every evening. A visit to these caves may also be welcome during the hot summer months due to their constant temperature of 14˚C. 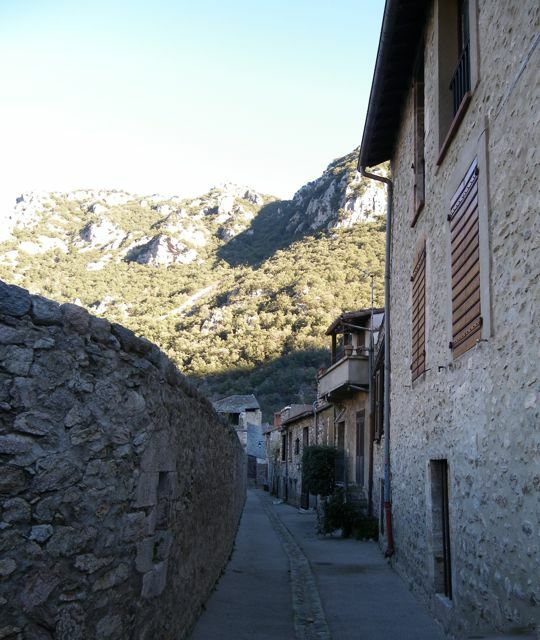 For more details about the town, shops, restaurants and bars, the fort and things nearby, you can visit www.villefranchedeconflent.com which also has listings for accommodation should you wish to stay. Bus: 2 Euro Return from Perpignan Bus Station located next to the new side of Train Station. Buy tickets on the bus. Train: 2 Euros Return from ‘old side’ Perpignan Train Station. Buy tickets from the red machines located in the hall. Nearby is the small village of Casteil to discover with its animal park, Parc des Animaux, the working Abbey de St Martin, and the spa town of Vernet-les-Bain. Eus and Prades are also worth a visit amongst the many nearby beautiful towns.